To follow my safari journey from the beginning, start with our post on Tswalu Kalahari here, then move to our review of Singita Sweni here. Londolozi is a private game reserve situated on the Sand River in the centre of the Sabi Sand Game Reserve. Established in 1926 and endorsed by Nelson Mandela as a model for nature preservation, it has been run by the Varty family since 2007 and consists of five camps: Tree Camp (6 suites), Founders Camp (10 chalets), Private Granite Suites (3 suites), Pioneer Camp (3 suites) and Varty Camp (10 chalets). Londolozi was the first game reserve in the world to be awarded with a Relais & Chateau listing - this has now been achieved by three of the camps: Tree Camp, Private Granite Suites and Pioneer Camp. We stayed at Pioneer Camp, which was absolutely incredible. Not only were the rooms over-sized and exquisitely furnished, the service was impeccable (kudos to our lodge manager Victoria) and the food top-notch (courtesy of executive chef Anna and her team). We were given lodge No. 1, which was the furthest from the reception and communal dining and living areas (while all the lodges have the same layout, we would recommend No. 1 for those seeking extra privacy). Unfortunately it was a little too cold to make much use of the private plunge pool or outdoor shower on the deck, but we did have 138 square metres of room to enjoy. Our first encounter with executive chef, Anna, was via lunch in the dining room before preparing for our first afternoon game drive at Londolozi. The hubby opted for the Londolozi club sandwich served with potato and beetroot crisps and I had the linguine with basil and mint pesto, grated zucchini, cherry tomatoes, ricotta and parmesan. Both were delicious, and a promise of good things to come. The meals we had here were the best of the three lodges we stayed at whilst on safari. The word "Londolozi" means "protector of all living things" in Zulu and with our first game drive, it was immediately apparent that the wildlife is abundant and flourishing in this glimpse of Eden. Having come from the drought-stricken northern Kruger by the Mozambique border, the Sabi Sands was lush with greenery by comparison (despite the rains not yet having come; the Sabi River a mere trickle exposing striking granite boulders along the bank). Here's a breakdown of what we saw during our two night stay in nature's paradise. On our first afternoon drive, we share a jeep with a honeymooning couple from Spain. With our ranger and tracker, we see animals immediately: sable antelope, elephants, giraffes, impala, water buck. The beauty of the surrounding landscape and its inhabitants has me awestruck all over again. I tell myself to enjoy the moment and take some time to frame my photographs and try different angles, rather than snapping paparazzi-style. Our first close encounter is with a trail of elephants, who come marching straight for the jeep, veering to the right at the last minute. The leader comes so close to my side of the open air vehicle that I swear if I stretched out my arm, we would touch. We pass by the river, where the grass is a bright verdant green. There is a large herd of impala as well as a group of water buck, having a feast. The highlight of the afternoon comes when we are alerted by radio to a lion kill. We see a lioness and her cubs in a captivating feeding frenzy over what appears to be the carcass of a water buck. We pass by some hippos, their eyes and ears periodically breaking the water's surface, and some fearsome looking crocodiles, before stopping the jeep for customary sun-downers. While enjoying a rooibos tea (my go-to drink throughout our Africa trip), the group suddenly goes quiet. The silhouette of a black rhino appears from around a bend in the road, and he makes a beeline for our direction, oblivious of our presence. 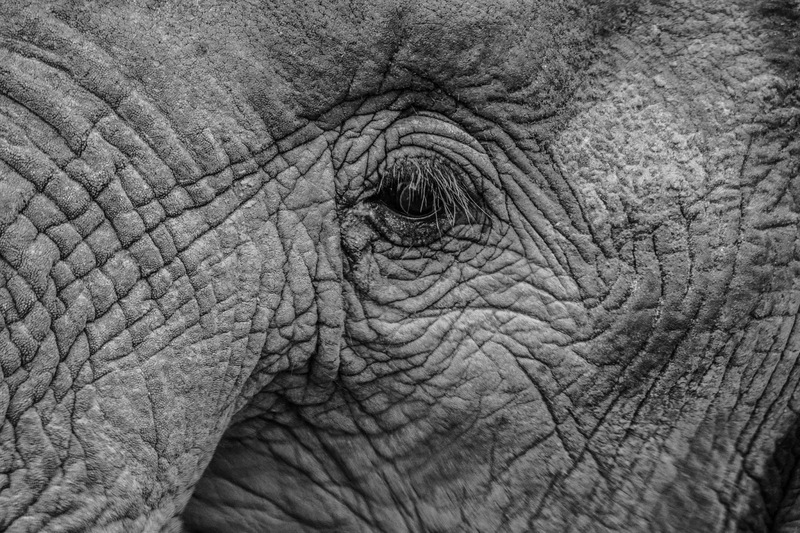 Our tracker quietly whispers that the rhino has terrible eyesight but a terrific sense of smell - it is only the direction of the wind which has kept our position hidden, for now. Our ranger motions for us to quickly get into the jeep if he gives the signal. Unable to hold my nerve, I squeak and the rhino is alerted. All of us jump into the jeep. The rhino continues with his business, defecates and marks his territory, before making a wide arc to avoid us. Night falls quickly, and we need torch light to see the cutest spotted owl perched in a tree. Dinner this evening is a group affair; we are told it is a Pioneer Camp tradition, since the camp is so intimate. It's a surf and turf inspired menu, executed well, and we retire to our room well fed. One of the wonderfully thoughtful things about Londolozi is that they offer camera lens rentals at reasonable prices (read up on the camera lenses available here). I'm excited to have the Nikon 80-400mm telephoto lens to road test tomorrow. It's an early wake-up but I am bright-eyed, bushy-tailed and full of excitement, like a child on Christmas Day. Having not yet seen the complete set of "Big 5" game animals, we are on the hunt for buffalo and leopard. But first, I eagerly test out my new zooming powers on some unsuspecting elephants and a hornbill. Then something life-changing happens: we see our first leopard. She is as stunning as I had imagined, moving with a grace and strength that is breathtaking. The restraint I was exercising before falls to pieces and I hurriedly take photo after photo in quick succession, all too wary that this may be our one and only encounter. We then join two other jeeps who are already at a lion pride sighting. It is still early and the large cats are active. When a camera bag drops out of a neighbouring jeep, a lioness spots the movement immediately and pounces on it. A tussle and chase ensues, and eventually a young male emerges as the victor. We stay with the lions and watch as they move across the savanna to find their late morning resting spot. The chief lioness leads and the young males and females fall into line, making good pace. It's the iconic safari scene of the grasslands dotted with jeeps and lions. With a leopard sighting under our belts, we finally earn our Big 5 stamp with a herd of buffalo. They were more elusive than expected but our tracker doesn't let us down. The cherry on top of this perfect morning is the sighting of a male ostrich guarding his nest. Like most birds, it is the male of the species with the beautiful plumage. Careful not to cause him undue anxiety, we dare not get too close or linger too long. Back at Pioneer Camp for breakfast, a scrumptious buffet greets us. There is an array of juices, pastries, fruit and eggs cooked to order. After breakfast, we embark on a walking tour of the various Londolozi camps, each of which has a distinct design and feel, and the staff village, which included a meander through traditional African huts. The hubby and I then go our separate ways: him to the spa for a massage in between drives, and me to the Creative Hub for my photo editing session. At the Creative Hub, I see my raw photos transformed through Adobe Lightroom over a private one hour session. Coupled with the camera and lens rentals and the ability to print professionally edited images on canvas on site, the Creative Hub is a real gem for the budding nature photographer. 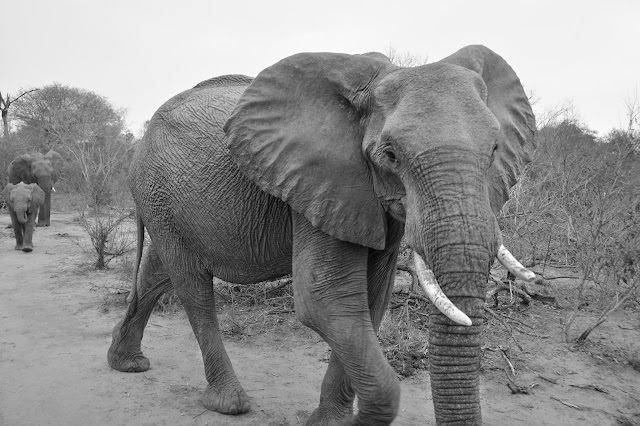 Time flies and it is time for our afternoon game drive. We set off to a known hyena den but our ranger warns us to lower our expectations, as the cubs may not venture out of the safety of the den. We wait patiently at the mouth of the den, until we glimpse the mother hyena. To my surprise, the baby hyena has a charcoal coat, so different from the spotted brown fur of his mother, and gorgeous inquisitive eyes. Buoyed by the sighting of mother and baby hyena, we continue on and see a trio of rhinos, one of them sharpening his horn on a tree trunk. When we pass by the river, we see that the hippos have come out of the water, much to the hubby's delight; we'd only seen them half submerged before. With sunset drawing near, we expect that we will soon stop for "happy hour". However, we are pleasantly surprised when we are brought to a small clearing to find Anna and Victoria have prepared a special surprise for us in the bush. There is a campfire set up, and we are all given a glass of buttery rum to counter the dropping temperature. There is a selection of drinks on offer, including an incredible local craft gin (Inverroche) and tonic. It is truly a magical way to spend our last night on safari. Retiring back to our rooms, another surprise awaits: the staff have decorated the room with rose petals and tea lights, and set up a private dinner on our deck, complete with a bottle of champagne. Love it. This morning I wake up before the hubby, who is so content with the sightings at Londolozi that he can't imagine anything better. He opts for an overdue sleep in, while I head off for our last game drive. The morning starts off slowly, as some new joiners to our jeep wish to see a zebra. They are delighted when we see one, while I try to be artsy. We pass by a female ostrich, a sleeping lioness and some rhino, and I start to wonder if I should have slept in too. All of a sudden, we hear the radio crackle: a leopard sighting! 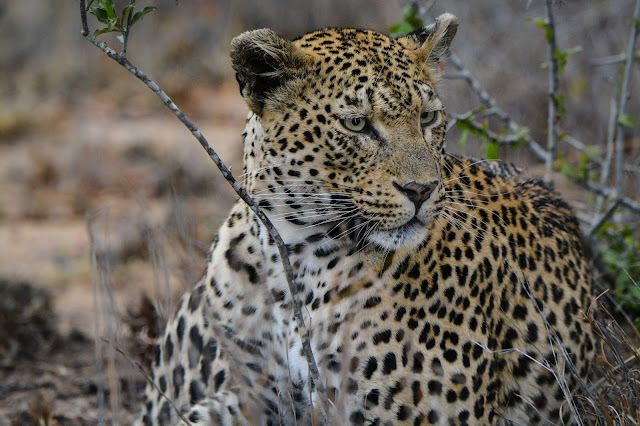 We drive quickly to join in, and I am so happy that I get to see a leopard one more time before I have to leave this place.The ranger tells us this leopard is the daughter of the one we saw yesterday - she is young and just finding her feet. She seems to have done well, as she has a kill in the tree above her: a half eaten impala carcass is visible through the branches. Guarding her food, her eyes constantly glance back towards her hiding place in the tree. She is ready to make a move if she needs to. 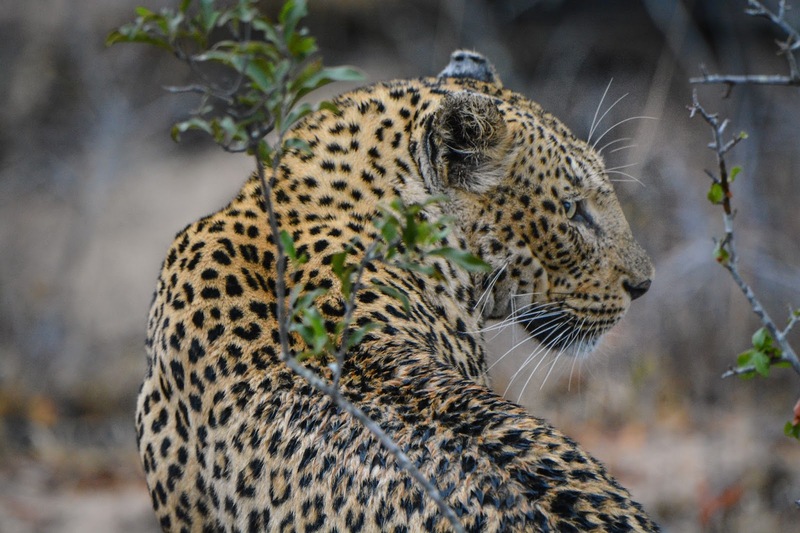 With no danger at present, the young leopard shows off for the camera. 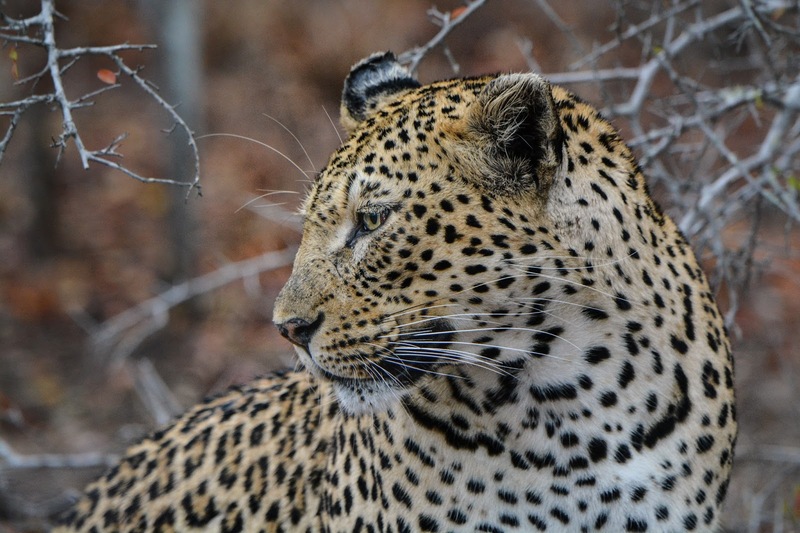 We take a quick detour to see this leopard's mother, who is camped nearby. The ranger believes the mother is hoping to take advantage of her daughter's kill. The young leopard, sensing a veiled threat, growls at her mother before leaping elegantly and swiftly into the branches of the tree. It literally takes her about two seconds to get to the carcass. Perched above the ground, she begins to feed on the impala. It's captivating yet gruesome watching her tear flesh off bone, blood staining the fur around her sharp jaws. My adrenaline is pumping - and I wish the hubby were with me to witness this incredible sighting! I clumsily try to take some videos for him on the iPhone, but alas, I am no videographer. We stay as long as we can, before the ranger says it is time to go - as some of us have a plane to catch! On the way back to camp, we see hippos, crocodiles and buffalo by the river. I take some final photos before it is time to return the borrowed lens. I excitedly describe the morning drive to the hubby over breakfast. It has been an absolute dream staying at Londolozi Pioneer Camp. Anna has one more parting gift for us before we say goodbye - she has for us, hot off the press, a guide on the best restaurants and cafes in Cape Town, a brand new publication exclusively for guests of Londolozi. 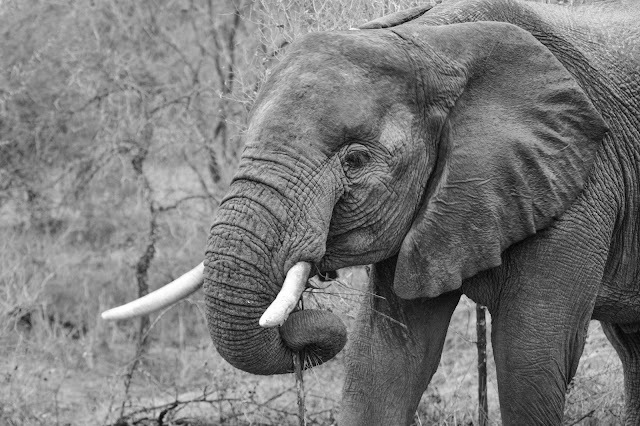 Londolozi is a very special camp. The diversity of the wildlife, the friendliness and hospitality of the staff, the impeccable food, the incredible accommodation and photographer-friendly facilities - it's a winning combination and I hope it never changes. The hubby and I vow to return one day.